The ancient Egyptians made many different kinds of bread. The different varieties appeared in tomb paintings as shapes such as circles and ovals. 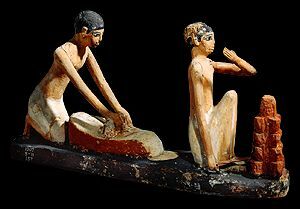 This wooden model of people making bread was found in an ancient Egyptian tomb.